This isn’t the first time we’ve come across a battery charging case for the iPhone, nor is it certainly going to be the last either, but it’s nice to know that there’s plenty of variety of owners out there looking to get a little bit of juice on the road. 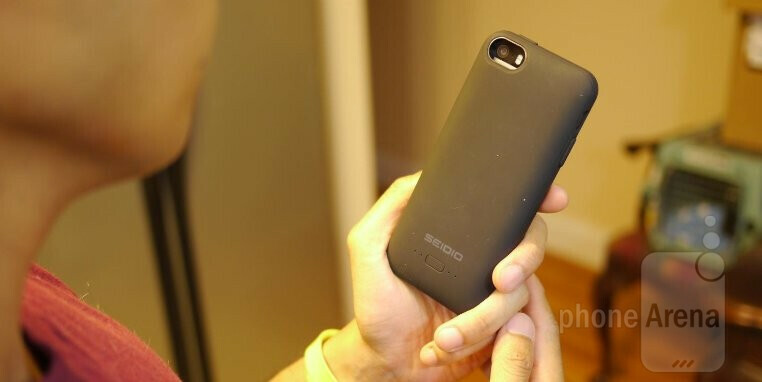 Seidio, of course, is a familiar name in the mobile accessories space, seeing that we’ve seen and covered several related things from them in the past. This time around, we’re checking out the Innocell Plus, which is an iPhone 5/5s battery charging case. Not surprisingly at all, the design is something we’ve come to view as customary and standard for an iPhone battery charging case – so there’s nothing out of the ordinary here with it. Donning an all-black matte finish, its design screams conventionality to the tooth, as many other similar cases sport the same design. As always with these types of things, it adds more bulk to the iPhone’s otherwise streamlined figure. On the flip side, though, we have to keep in mind that it’s packing along a 2000 mAh battery. Two components make up the Innocell Plus, the main battery portion and a snap-on bezel that wraps around the phone. Basically, there’s a notch on the bottom side of the case that allows us to pry off the snap-on bezel. Once it’s off, we’re able to slide the iPhone into position – where the Lighting cable comes into contact with the port on the iPhone. Unfortunately, the headphone jack becomes recessed, to the point that some cables might not fit through the opening. At first, the power button feels stiff to the touch, but we find a springier response if it’s pressed down towards the right side. In the rear, there’s a flush oval shaped button that displays the battery’s charge with a single press – while performing a long press initiate the charging process. Blue LEDs running across the back visually show us how much juice is left, where each one represents a 25% charge. The Innocell Plus also features a microUSB port to charge the battery. At the same time, too, it allows for data syncing and charging of the phone as well – so that’s an incentive to leave your Lightning cable at home and rely on good old universal microUSB. Reported by Seidio to provide a 125% increase in battery power, we’re only able to get a drained iPhone 5s back to the 85% mark before it’s tapped out. Needless to say, that’s a far cry from the rating mentioned by the manufacturer. Luckily, the case is somewhat cheaper than some of the other in the space – $69.95 for the case itself, while a combo pack that includes the Innocell Plus holster can be snagged for $79.95. If the price is right for you, it’s not bad of an option if you’re willing to accept some if its compromises. Review some more cases for the Xperia Z2 please! I wonder how rugged it is? Most battery cases just fall off your phone if you drop it!